Flippant is named after the beloved braided sandwich loaf, the Broccoli-Ham Flip that my mother made growing up. The open lattice of the lace pattern reminds me of the interlaced pieces of bread across the top of the braid. In fact, however, this pattern is anything but the frivolous thing the title suggests. Flippant is a long-sleeved lacy cardigan with clean, geometric lines that falls at mid hip. The body of the cardigan is worked in one piece up to the armholes at which point it is divided, and the fronts and back are worked separately. The sleeves are worked separately and set in. Flippant will showcase your knitting prowess in both your work and casual outfits. Designed for layering, the sleeves have a relaxed fit and the body's waist shaping comes from the inherent elasticity in the lace pattern. When selecting a size, please note that the pattern measurements are given at a heavy blocking of the lace pattern and that with light blocking the width can be up to 15% smaller. The lace pattern has a varying number of stitches. Only count stitches after completing Row 5, 6, 11, or 12 of pattern. If counted on Row 1, 2, 3, 4, 7, 8, 9, or 10, the stitch count decreases by 1 stitch per pattern repeat. All stitch counts in the pattern are given as if counted in Row 5, 6, 11, or 12. When shaping neck and armhole, make sure to account for pattern increases and decreases, working shaping into stitch pattern where possible. If needed, work any partial pattern repeats in stockinette stitch, making sure each repeat is 8 sts wide (before shaping). All measurements are given after blocking. For an extraspicy experience, provisionally cast on the stitches for the body, skip the garter stitch border and begin in lace pattern. During finishing, add the stitches from the body to the stitches for the garter stitch border after picking up stitches along other edges, place markers on either side, and miter the edges in the same manner. Row 1 [RS]: K1, *k2tog, k1, yo, k1, ssk, k2; rep from * to last 2 sts, k2. Row 2 and every foll WS row: Purl. Row 3: *K2tog, k1, yo, k1, yo, k1, ssk; rep from * to last 3 sts, k3. Row 5: K2, *yo, k3, yo, k1, ssk, k1; rep from * to last st, k1. Row 7: K4, *k2tog, k1, yo, k1, ssk, k2; rep from * to last 7 sts, k2tog, k1, yo, k1, ssk, k1. Row 9: K3, *k2tog, k1, yo, k1, yo, k1, ssk; rep from * to end. Row 11: K2, *k2tog, k1, yo, k3, yo, k1; rep from * to last st, k1. Rep Rows 1-12 for patt. Row 1 [RS]: K1, k2tog, k1, yo, k1, ssk, k4. Row 3: K2tog, k1, yo, k1, yo, k1, ssk, k3. Row 5: K2, yo, k3, yo, k1, ssk, k2. Row 7: K4, k2tog, k1, yo, k1, ssk, k1. Row 9: K3, k2tog, k1, yo, k1, yo, k1, ssk. Row 11: K2, k2tog, k1, yo, k3, yo, k2. With smaller needles, CO 139[155, 171, 187, 203, 227, 243] sts. Do not join. Row 1 [RS]: Work Loose Lattice Lace Pattern across row, working pattern repeat 17[19, 21, 23, 25, 28, 30] times in total. Cont in lace pattern until a total of 113[113, 113, 113, 107, 107, 107] lace pattern rows have been worked (piece measures approx. 15.25[15.25, 15.25, 15.25, 14.5, 14.5, 14.5] inches from cast on), or desired length to armhole, ending with Row 5 or 11 of lace pattern. Next Row [WS]: Work 33[35, 40, 41, 42, 46, 48] sts in pattern and place these sts on holder; BO 0[3, 5, 9, 15, 19, 23] sts for armhole, pattern until there are 73[79, 81, 87, 89, 97, 101] sts on RH needle and place these sts on holder; BO 0[3, 5, 9, 15, 19, 23] sts, work in pattern to end. Right front will be worked over rem 33[35, 40, 41, 42, 46, 48] sts. Decrease row [RS]: Work in pattern to last 3 sts, k2tog, k1. 1 st dec'd. Next Row [WS]: Work in pattern. Rep last two rows 2[4, 5, 6, 6, 8, 8] times more. 30[30, 34, 34, 35, 37, 39] sts. Cont in patt for 36[32, 36, 40, 40, 42, 42] rows more (piece measures approx. 5.25[5.25, 6, 6.75, 6.75, 7.5, 7.5] inches from beginning of armhole), ending after Row 12[12, 6, 12, 6, 12, 12] (WS) of patt. Row 2 [WS]: Work in pattern. Row 3 [RS]: K1, ssk, work in pattern to end. 1 st dec'd. Rep last two rows three times more. 18[18, 18, 18, 19, 19, 21] sts. Cont in patt for 3[7, 5, 3, 7, 5, 9] rows more (piece measures approx. 7[7.5, 8, 8.5, 9, 9.5, 10] inches from beginning of armhole). Note: Change to st st if and when necessary to maintain correct stitch count, preferably after Rows 5, 6, 11 or 12 of pattern. Row 1 [RS]: Work to last 3[3, 3, 3, 4, 4, 5] sts, w&t. Rows 2, 4 & 6 [WS]: Work in pattern. Row 3 [RS]: Work to last 7[7, 7, 7, 8, 8, 10] sts, w&t. Row 5 [RS]: Work to last 11[11, 11, 11, 12, 12, 15] sts, w&t. Row 7 [RS]: Work all sts, picking up and working wraps with wrapped sts. Place sts on stitch holder. Place 33[35, 40, 41, 42, 46, 48] sts held for Left Front on needle with RS facing and join yarn at armhole edge. Decrease row [RS]: K1, ssk, work in pattern to end. Cont in patt for 35[31, 35, 39, 39, 41, 41] rows more (piece measures approx. 5.25[5.25, 6, 6.75, 6.75, 7.5, 7.5] inches from beginning of armhole), ending after Row 11[11, 5, 11, 5, 11, 11] (RS) of patt. Row 1 [WS]: BO 8[8, 12, 12, 12, 14, 14] sts, pattern to end. 22[22, 22, 22, 23, 23, 25] sts. Row 2 [RS]: Work in pattern to last 3 sts, k2tog, k1. 1 st dec'd. Row 3 [WS]: Work in pattern. Cont in patt for 4[8, 6, 4, 8, 6, 10] rows more (piece measures approx. 7[7.5, 8, 8.5, 9, 9.5, 10] inches from beginning of armhole. Note: Change to st st if and when necessary to maintain correct stitch count, preferably after Rows 5, 6, 11 or 12 of pattern. Make sure to end lace pattern on same row as Left Shoulder. Rows 1, 3, 5 & 7 [RS]: Work in pattern to end. Row 2 [WS]: Work to last 3[3, 3, 3, 4, 4, 5] sts, w&t. Row 4 [WS]: Work to last 7[7, 7, 7, 8, 8, 10] sts, w&t. Row 6 [WS]: Work to last 11[11, 11, 11, 12, 12, 15] sts, w&t. Row 8 [WS]: Work all sts, picking up and working wraps with wrapped sts. Place sts on stitch holder. Place 73[79, 81, 87, 89, 97, 101] held stitches back on needle with RS facing and join yarn at right armhole edge. Decrease Row [RS]: K1, ssk, work in established pattern to last 3 sts, k2tog, k1. 2 sts dec'd. Repeat these two rows 2[4, 5, 6, 6, 8, 8] times more. 67[69, 69, 73, 75, 79, 83] sts. Cont in patt for 47[47, 47, 51, 55, 55, 59] rows more (piece measures approx. 6.75[7.25, 7.5, 8.25, 8.75, 9.25, 9.75] inches from beginning of armhole), ending after Row 5[5, 5, 5, 11, 11, 11] (RS) of lace patt. Note: Change to St st if and when necessary to maintain correct stitch count, preferably after Rows 5, 6, 11 or 12 of pattern. Make sure to end lace pattern on same row as front shoulders. Row 1 [WS]: Work 21[21, 21, 21, 22, 22, 24] sts in pattern and place on stitch holder for left shoulder, BO 25[27, 27, 31, 31, 35, 35] sts, patt to end. Rows 2, 4 & 6 [RS]: Work to last 3 sts, k2tog, k1. Row 3 [WS]: Work to last 3[3, 3, 3, 4, 4, 5] sts, w&t. Row 5 [WS]: Work to last 7[7, 7, 7, 8, 8, 10] sts, w&t. Row 7 [WS]: Work to last 11[11, 11, 11, 12, 12, 15] sts, w&t. Row 8 [RS]: Pattern to end. Row 9 [WS]: Work all remaining sts, picking up and working wraps with wrapped sts. Place sts on holder. Place 21[21, 21, 21, 22, 22, 24] held sts of left shoulder on needle with RS facing and join yarn at neck edge. Row 1 [RS]: K1, ssk, work to last 3[3, 3, 3, 4, 4, 5] sts, w&t. Rows 2, 4 & 6 [WS]: Purl to end of row. Row 3 [RS]: K1, ssk, work to last 7[7, 7, 7, 8, 8, 10] sts, w&t. Row 5 [RS]: K1, ssk, work to last 11[11, 11, 11, 12, 12, 15] sts, w&t. Row 7 [RS]: Work all remaining sts, picking up and working wraps with wrapped sts. Place sts on holder. With smaller double pointed needles, CO 43[45, 47, 49, 53, 57, 61] sts. Join to work in the round and pm for beg of rnd. Rnds 1, 3, 5 & 7: Purl. Note: Read ahead! 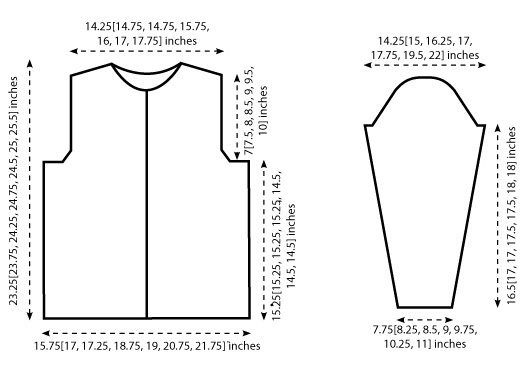 Sleeve pattern and increases are established at the same time. 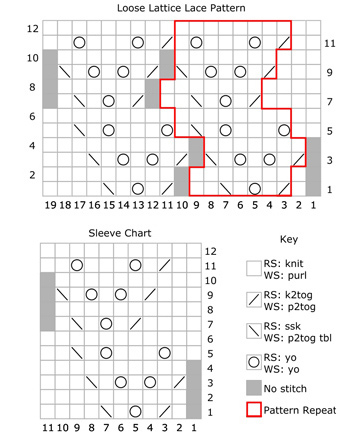 Set-up Rnd: K16[17, 18, 19, 21, 23, 25], pm, k11 (this counts as Row 12 of Sleeve Pattern), pm, k16[17, 18, 19, 21, 23, 25]. This sets the pattern, with St st outside the markers and Sleeve Chart worked between the markers. The next rnd of Sleeve Chart will be Rnd 1. Increase rnd: M1, work in pattern to last stitch, M1, k1. 2 sts inc'd. Work 6[6, 5, 5, 5, 4, 3] rnds in pattern as established. Repeat these 7[7, 6, 6, 6, 5, 4] rounds 16[17, 19, 20, 20, 23, 28] times more. 77[81, 87, 91, 95, 105, 119] sts. Work even in est patt until sleeve measures 16.5[17, 17, 17.5, 17.5, 18, 18] inches or desired length to underarm, ending with an even rnd of the lace pattern. Next row [RS]: BO 2[2, 3, 5, 9, 11, 14] sts, pattern to end of row, turn. Work will now be worked back and forth in rows. Next row [WS]: BO 2[2, 3, 5, 9, 11, 14] sts, patt to end. 73[77, 81, 81, 77, 83, 91] sts. Decrease row [RS]: K1, ssk, work in pattern to last 3 sts, k2tog, k1. 2 sts dec'd. Repeat these 2 rows 9[9, 12, 8, 6, 5, 8] times more. 53[57, 55, 63, 63, 71, 73] sts. Repeat these 4 rows -[-, -, 3, 4, 3, 2] times more. -[-, -, 55, 53, 63, 67] sts. BO 2[2, 2, 2, 2, 0, 0] sts at the beginning of the next 2[4, 6, 8, 6, 0, 0] rows, then BO 3 sts at the beginning of the next 4[4, 4, 4, 4, 12, 10] rows. 37[37, 31, 27, 29, 27, 37] sts. BO all sts in pattern. With right sides facing, use a three-needle bind off to bind the stitches of the left shoulder pieces of the front and back together. Repeat for the right shoulder. Weave in ends and block to measurements shown in schematic. With WS facing, smaller circular needle, and starting at hem edge of Left Front, pick up and knit 122[122, 127, 131, 127, 131, 131] sts to neck bind off, pm, pick up and knit 82[90, 95, 96, 102, 107, 113] sts around to end of Left Front neck bind off, pm, and then pick up and knit 122[122, 127, 131, 127, 131, 131] sts to hem of Right Front. 326[334, 349, 358, 356, 369, 375] sts. Rows 1 & 5 [RS]: *Knit to 2 sts before m, kfb, k1, sl m, k1, kfb; rep from * once more, knit to end. Rows 2, 4 & 6 [WS]: Knit. Row 3 [buttonhole row - RS]: K7[7, 5, 5, 5, 5, 5], (yo, k2tog, k10[10, 11, 10, 11, 10, 10] sts) 9[9, 9, 10, 9, 10, 10] times, yo, k2tog, (knit to 2 sts before m, kfb, k1, sl m, k1, kfb) twice, knit to end. Row 7 [RS]: BO all sts knit-wise. Use safety pins to mark positions of buttons on left front edge, opposite buttonholes. Sew buttons in place. Weave in any remaining ends. 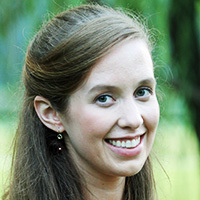 Reconciling her love of hand knit sweaters with the warmer seasons, Nora is an avid knitter learning to adjust to life in California. See more of Nora at HinchingForward.com, or find her on Ravelry as elodie963.